Carol, a woman in my watercolor class, mentioned in class last week about making prints from styrofoam. GENIUS. 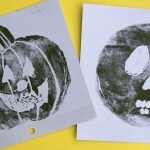 It’s not nearly as painstaking (or dangerous) as linoleum block prints. It stuck with me, and a woman in my church asked me if I had any ideas for a school class activity for a Halloween party, well here you go, Wendy. Hope this works out!! 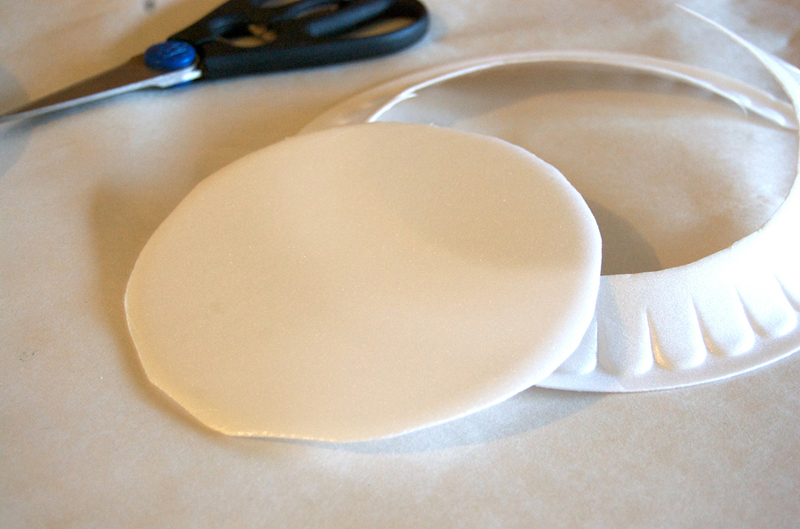 Cut the bottom of the plate out. I chose a circle, it’s easy. You can cut any shape you want. 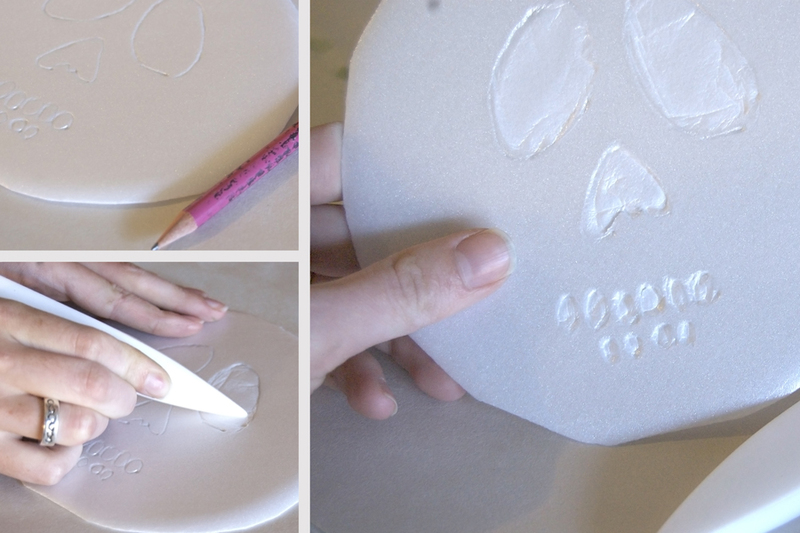 Draw on the surface of the Styrofoam with a pencil. After you’re done with outlines you can depress large spaces (these spaces will end up white) with a bonefolder or tongue depressor. 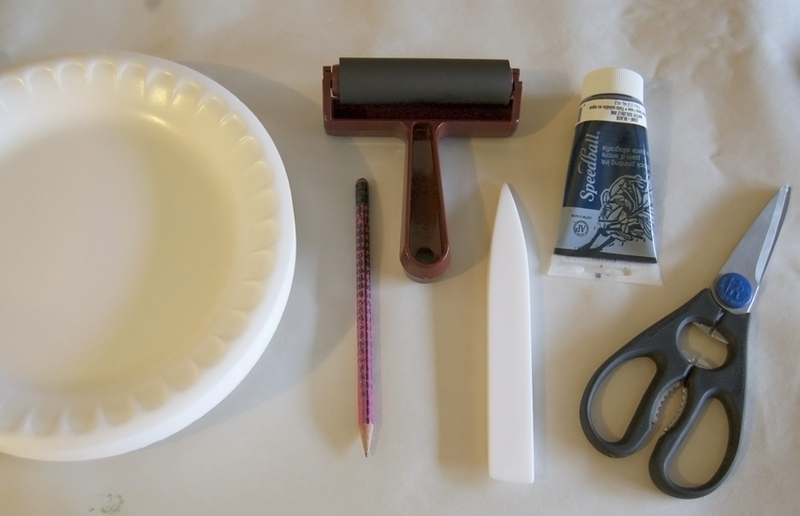 Squirt ink on a “throw away” sheet of paper to get your brayer evenly coated with ink. Roll ink over the surface of your print. Be sure not to press too hard or you’ll ink up your white spaces. Apply the paper face down onto your “plate”. With the palm of your hand or side of your fist, rub the back side of the paper to transfer the ink. Remove the paper. Great tutorial. Yes, definitely less intimidating than block printing! And I’m glad to have been of help! That turned out so nice! Awesome! Thanks for sharing. That is very cool! I’d never have thought of trying to print with something like styrofoam. Hi – I am new to your blog just today in fact. I have been making stamps lately but this is so much simpiliar! I love it! Great job! This is cool! I am in a print class now and I love printing with linoleum. But this is a cheaper way to get sort of the same results!! I really don’t like styrofoam but if I know I will keep it perhaps I shall buy a small pack. Love this craft project. I’m bookmarking it and saving it for when my grands are visiting!